Do you travel with a loved one who has special needs? Planning a wonderful family vacation should be fun, not stressful. Here are some destinations that go above and beyond to accommodate every member of your family. This San Antonio theme park was designed with exceptional accessibility in mind. Experience more than 25 attractions for all ages and abilities to enjoy together. Play make-believe in The Sensory Village, buckle up for the Off-Road Adventure Ride, or hop aboard Wonderland Express, a wheelchair-friendly train. Inspiration Island, a fully accessible waterpark, is open during summer months. Families love the boat ride and multiple splash pads, including one with warm water for guests with muscular conditions. Waterproof wheelchairs are available to borrow for free. Morgan’s Wonderland is closed in January and February. Admission is free for guests with special needs. See website for details: www.morganswonderland.com. How about a relaxing camping trip on Lake Superior? Wisconsin’s Apostle Islands National Lakeshore earned the 2017 “Accessibility Excellence” award from the National Park Service. The park boasts accessible campsites at Sand and Stockton island Quarry Bay. Each site offers a wooden tent pad, and a raised boardwalk leading from the dock to the campsite. Vaulted toilets and wheelchair-friendly picnic benches are available. Make a reservation by calling 715-779-3397 ext. 2, or visiting https://www.recreation.gov. While you’re exploring the islands, plan an adventure with Wilderness Inquiry, an inclusive outdoor travel organization offering adapted equipment to get everyone out on the water: www.wildernessinquiry.org. Also note that people with a permanent disability can apply for an Access Pass to the National Parks. 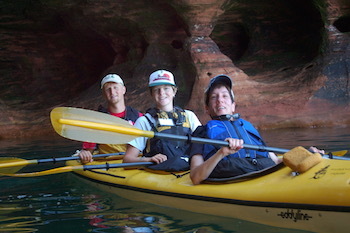 Pass holders receive a discount for parking, docking, camping, and interpretive services at Apostle Islands National Lakeshore (and hundreds of other recreational sites). Learn more here: https://store.usgs.gov/access-pass. In 2017, the Sheraton Park Hotel in Anaheim launched a comprehensive program to support guests with autism. It’s called the MAX (member of autism care services) Program, and guests can request services during booking. A behavioral therapist was hired to train the hotel’s staff. The restaurant now offers gluten- and casein-free options for people with special dietary needs, along with adaptive eating utensils and sippy cups. Visit the front desk to borrow iPads, weighted vests and exercise balls. The gift shop sells adult diapers and swim accessories. Also available are oversized stroller rentals and autism-aware babysitting services. Guests interested in the MAX Program can call 1-800-325-3535 and ask for the MAX Program Rate. A staff member will follow up with a personal call to offer more details and discuss the family’s specific needs. In the future, Sheraton hopes to implement this program globally. This organization takes the worry out of cruising. If you have a child with a cognitive, intellectual or developmental disability, Autism on the Seas offers a number of vacation services to accommodate your family. They provide Staffed Cruises on Royal Caribbean, Celebrity, Norwegian, Disney and Carnival Cruise lines. Staffed Cruises include adapted family activities, private sessions at the ship’s entertainment venues, reserved seating at meals and shows, staff support at mealtimes, priority boarding and disembarkation, and much more. The organization caters to all guests with special needs, regardless of age. If you prefer to travel without staff, Autism on the Seas also offers a free Cruise Assistance Package. To learn more, visit https://autismontheseas.com. Looking for a vacation rental? Sites like Airbnb have changed the rental industry, but until recently, offered few resources for those seeking accessible properties. Enter: Accomable (now partnering with Airbnb). This online marketplace lists hundreds of vacation rentals in 60 countries. Each listing offers photos and detailed information about the site’s accessibility adaptations. Enter your desired destination, and narrow the search by selecting required amenities, such as a roll-in shower or adjustable bed. Learn more at https://accomable.com.